Now that English spring has well and truly arrived, it’s time to forage for nettles. They grow wild just about everywhere around here, including along the verges of the farm lane next to Long Barn. I love being able to simply walk outside my door and harvest such a useful plant. High in iron, potassium, manganese, calcium and vitamins A and C, nettles are also a decent source of protein. 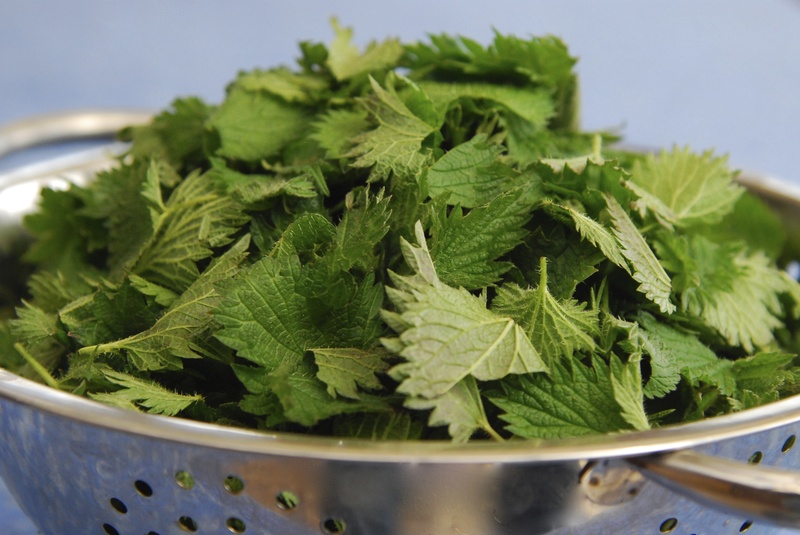 As a medicinal herb, nettles are used to treat arthritis, anemia, hay fever and kidney problems. Collecting nettles is a fairly simple endeavor: the key is to wear protective clothing (thick gardening gloves, long-sleeved shirt, socks, and jeans) over every bit of exposed skin, to seek out the youngest plants—less than knee-high—and to pick only the tender top leaves. In no time at all, I have a basket full. Back in the kitchen, I discard the stems and wash the leaves. Then I submerge the nettles in a pot of water and simmer for about 5 minutes, until the leaves are wilted and I’m sure they are fully cooked. (It’s not toxic to touch or even ingest an uncooked nettle leaf, but I suspect it would be quite unpleasant.) After draining the cooked nettles through a colander and pressing out any excess liquid I’m left with a small batch of what looks like vivid green spinach, though the taste will be less astringent, more floral. In a large soup pot over medium heat, warm the olive oil. Add the carrot, leeks and potato and cook for about 10 minutes, until the vegetables start to soften. Add the stock and the anchovy paste, bring to a boil, then reduce heat to a simmer and cook for 10 to 15 minutes, or until the potato is soft. Add the nettle leaves and simmer for a few minutes. Remove from heat. With an immersion blender or in a food processor, blend the soup until smooth. Return to the pot and season with the salt and pepper (add a little more to taste if necessary), then stir in the heavy cream if using, or serve garnished with a dollop of crème fraîche. The Next Nettle Adventure is already planned: Cooked nettles blended with crushed garlic cloves, pine nuts, olive oil and parmesan cheese—Pesto. Can’t wait! At first when I saw your purple glove I thought it a wierd english root! Is it the same nettles that grow in the forest here in Santa Cruz? or you could go to Ristorante Avanti, and have it there…..